The via ferrata, or “iron way”, is a fixed-aid climbing route, designed to allow non-rock climbers to tackle challenging rock faces using artificial aids which can include cables, ladders, iron rungs and pegs or stanchions. The via ferrata lets you enjoy a high-adrenaline adventure sport. 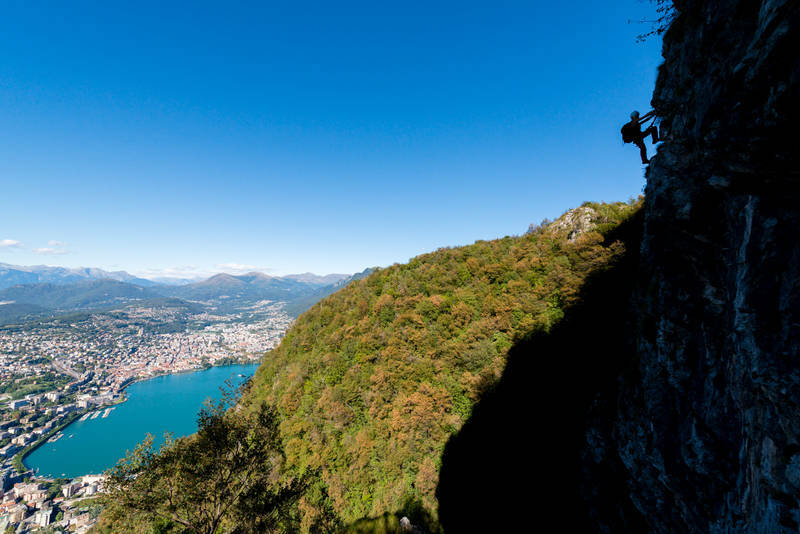 Unlike mountain paths, the via ferrata is an artificial climb route up what are often vertical rock faces. Safety is not a problem as long as climbers know the basic rules on how to use the aids to proceed and are properly equipped. A continuous wire cable runs along the route, making it safe from start to finish, and climbers must clip their lanyards to the cable. Accompanied by a mountain guide, anybody can climb the via ferrata, as long as they are in good physical shape and have no fear of heights. “Dolomite type” ferrata with far less artificial material, where the cable is taut between stanchions and serves as a safety aid and as a handgrip while climbing. The route takes you across the north-west rock face, covering an elevation gain of around 150 metres, left of the funicular track. The route is over 250 metres long and is challenging; those who decide to try it need to be strong and in good shape. The climb is not a straight line, but is fun and varied and its exceptional position offers superb views. A steep path leads from the intermediate funicular station (in Pazzallo) to the start of the via ferrata, requiring around 50 minutes. From the end of the via ferrata, you can choose whether to take the beautiful path down to Pazzallo, or walk on up to the summit, which takes around 20 minutes, to the funicular departure point. Overcrowding with resulting risk of stonefall (helmet! ), bad weather and storms.